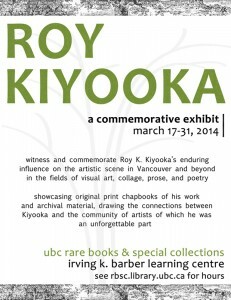 Original Roy Kiyooka chapbooks and other archival material will be showcased at the University of British Columbia Rare Books & Special Collections on Level 1 of the Irving K. Barber Learning Centre. Kiyooka’s works have enduring influence on the Vancouver art scene with themes of resistance against mainstream ideas of national identity, artistic success and artistic conventions, visible through his unconventional command of language, the use of Japanese Canadian ‘inglish’, as he deals with issues of national identity facing Japanese internment during the Second World War. The exhibition, commemorating the twentieth anniversary of Kiyooka’s passing, runs from March 17-31 from 10 a.m.-4 p.m. Monday through Friday, and 12 p.m. – 5 p.m. on Saturdays.